Join the PJ Masks at intu Lakeside when they soar into Essex for some heroic fun! Children can enjoy a special day of heroic fun at intu Lakeside on 14 August when Catboy, Owlette and Gekko from Entertainment One’s (eOne) PJ Masks take over the popular shopping destination. Fans of the popular animated TV series, which airs daily on Disney Junior, Tiny Pop and Netflix, will be able to meet their favourite character and take part a specially created ‘Hero Training Academy’ being run at intu’s other shopping centres across the UK as part of its offer to local families. 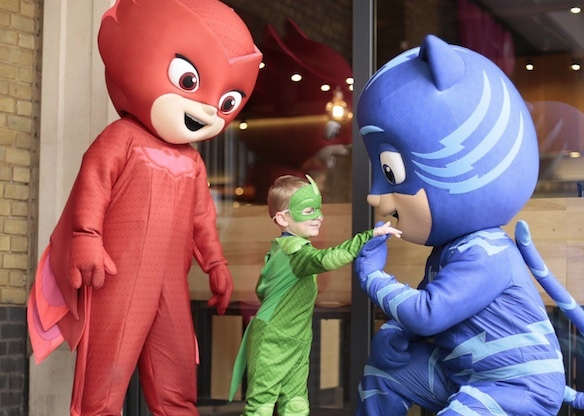 They will learn how to move like their favourite PJ Masks hero by enrolling in the ‘HeroTraining Academy’ and also have a photo taken with Catboy, Owlette and Gekko who will be soaring into Essex to make special appearances at the free, fun-packed event. There will also be a competition to win a set of PJ Masks prizes. Spaces are limited and can be booked at www.intu.co.uk/PJ-Masks.